I caught my husband's cold over the long weekend so I didn't work on any projects. Zero. Not one stitch. Kind of a lost weekend, and not much in the way of progress to show this week. I did get some great things in the mail today that I thought I'd post. I feel like I'm gloating but I prefer the term "sharing". First is my belated Mother's Day gift from Tracey (daughter #3, or twin #1) and her husband Eliot. Tracey and Eliot just moved from Utah to Oklahoma for law school and we all really miss them. I can't tell you how much I love this necklace. It is so pretty and I love the chain. Tracey got it at Etsy. I love getting and giving gifts from Etsy. Thanks so much to Tracey and Eiliot! I ordered this product called Invisigrip. I'm not going to include a link because you can get it just about anywhere. Its a clear non-slip material to apply to the back of Omigrid rulers. I've been using those little sand paper stickers but for the Dear Jane rulers I wanted nothing obscuring my measuring. So I thought I'd try this. It says you can even apply it to your cutting mat but I think I'll just use it on the back of my templates/rulers. Anyone used this yet? I can't even imagine going back to using rulers with no grip ability. And yes, new fabric. Shhhh. The Trueup blog is not good for the the fabric diet. Just warning you. 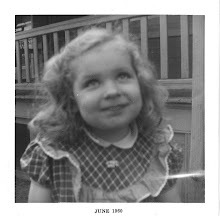 The subtitle on the blog says "All fabric, All the time". Enough said. 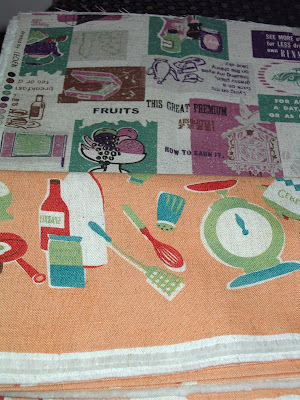 I have a thing for kitchen fabric and kitchen themed quilts. 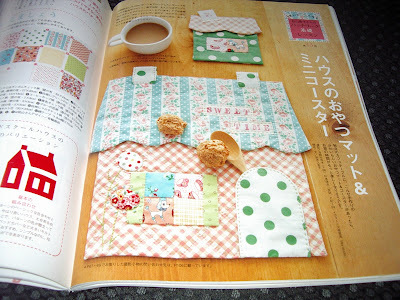 I have made 7 kitchen quilts to date and have one in the planning stages/list currently. 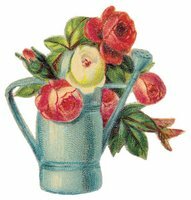 I saw this apron on Barbara's blog a bit ago and fell in love with it. I got the pattern a week ago and I misplaced it but now it's found. Another project(s) on the list. I really love the shape and fabrics Barbara used. And I also got a little package from Japan. 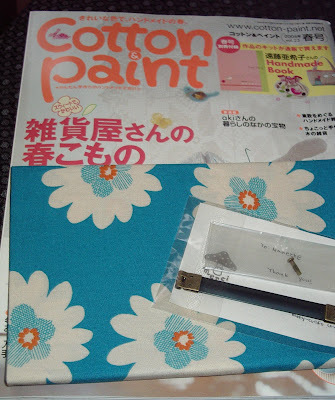 It's my latest Cotton and Paint issue along with a fat quarter of this blue daisy fabric. The little purse hardware was a cute gift. I really need to get my brother-in-law to start translating these books for me since he does speak Japanese. This little softie is so cute. I don't have grandchildren so I won't make it but it is really sweet. 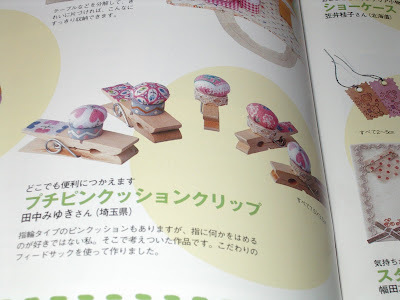 These little pincushions on clothespins are so cute. Wouldn't they make great gifts! This little house is darling. 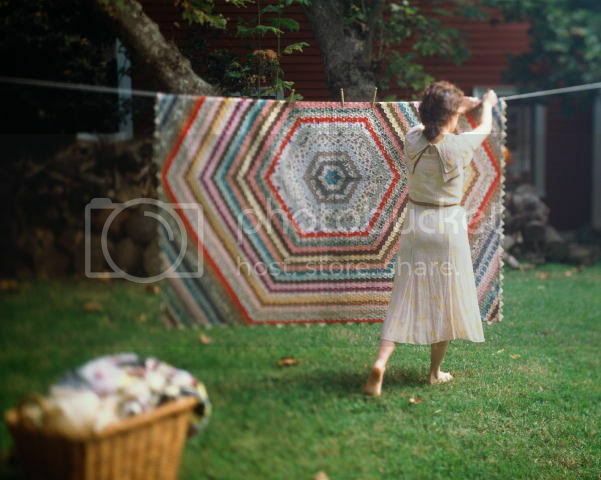 Again, I want to make a house quilt but that project list is getting so long. This issue has several matryoshkas in it so I know this trend isn't over yet. The little keychain is sweet and with a bell on it, too. 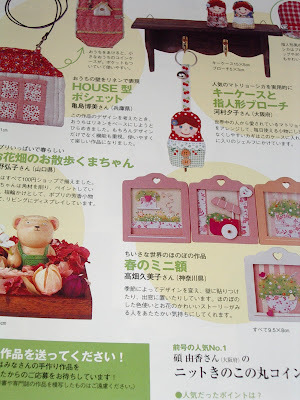 Oooh, cute Japanese ideas -- don't you just love their books? Thanks for sharing! Lovin' that necklace! matryoshkas - how is it pronounced??? Hope you are feeling better. I think that you might be a little bit spoiled, Nanette! Darn it! I forgot AGAIN! My husband was even at a meeting and Kenna was off playing so I had the time, I was just reading "THE HOST" and I'm almost done so I guess I was distracted! I think I might need a reminder next month, if you happen to remember! Thanks! I loved all of the cute stuff! Hope you're feeling better! Ahh is that Cotton Paint from Kitty Craft? Its that site that put the Kitty in Pamkittymorning. 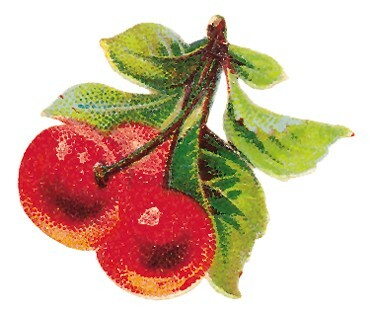 Yum, all your goods look, GOOD! Okay, girlfriend, if that's what happens when you have a bad weekend (i.e. sick), I'm gonna be sick soon! What goodies. Just gets the saliva going, doesn't it? Thanks for sharing. I'm going out to find the invisigrip. Never heard of it. Oh how I love your new kitchen fabric. 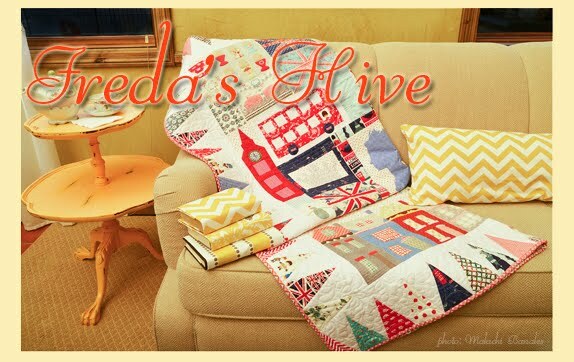 Have you done a post about all of your kitchen fabric quilts? I'd love to see them. You some fun things in the mail for. Love that necklace - what a sweet gift. I have used that grip stuff and it works great on the rulers. You won't be sorry. Your mail is very exciting. Is it like that every week? I could learn to get over the whole "bill" thing, if the rest of the mail was always that much fun. Let us know on the Invisagrip thing. I'm interested. You have got one quality mailbox if that's the sort of stuff you find! Hope to see you over there. And spread the word, our goal is 200 by the end of 2008! hugs! I love the necklace, too! 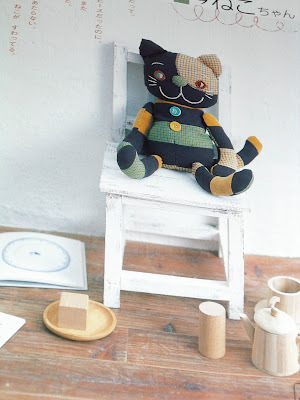 What a fun post....I think I might make one of those cute little pincushions. They are adorable! Oh, now you are making me want to buy Japanese mags even though I have sworn I won't buy anymore for a while. Thanks for the sneak peek of the projects. I love those books!! I am afraid to click on that fabric blog link...but I can hear it calling to me so I'm afraid I'm going to have to check it out. Hope you're feeling better soon. 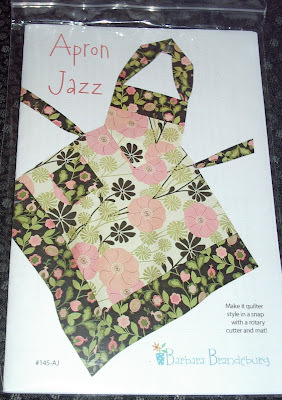 I also bought the jazzy apron pattern from Barbara. I made it up a couple of weeks and I LOVE IT!!! ♥ Hope you do too. 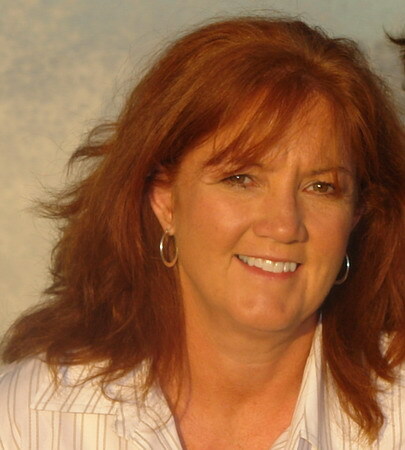 Your mothers day necklace is so beautiful and I'm drooling over your cotton and paint! Wow...all those ideas are so fun. I love those little pincushions and the house...ohhh the house. I would also love a mailbox like yours!!! I wish I got fun stuff like that in the mail! All I ever get is stupid ads and stupid bills. What are some tips for making sure to always have enjoyable, exciting mail?? You must have a secret, because you are ALWAYS getting such cute things! Thanks for the tip on Invisigrip! I'm going to pass this along to my wife and her sister, they will both be grateful! Happy Birthday Natalie - 26!